It happens to all of us. At some points in life, we get stuck in a rut. This can be in terms of our wardrobe, in work or just in general life. Right now, I'm in a bit of a life rut. After coming back from America (oh why couldn't we stay?) I've been looking for a new job. Doing cover letters day in, day out can get pretty repetitive and it becomes a bit sad when the highlight of your day is heading downstairs to make yourself a coffee. Usually, one rut affects the other, so a life rut can lead to a wardrobe rut, and it all comes tumbling down. I've been careful not to let that happen this time, taking time to be playful with my outfits and pay attention to detail. It might sound daft, but having a special touch on my outfit can make me feel a whole lot better not just about my wardrobe choices but about my day in general. Have you ever worn a great pair of shoes and felt like you could take on the world? Then you know what I mean. 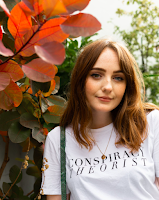 It can be so easy to throw on a hoodie and pair of trackies when you're not doing much or working from home, and whilst that's good for some, I definitely find making an effort with the way I dress helps me to feel productive. Of course I don't sit at my desk with curled hair and a full face of makeup every day, but some comfy but sassy clothes can keep me feeling motivated all day long. To anyone who's working from home and struggling to get out of bed, whether you're self employed or a student, my top tip has to be, put on some shoes. Simple, but it works. Also, don't make your bed look too inviting. Pile some stuff on there, whether it's some books or some makeup, and all of a sudden that nap doesn't seem so appealing if it means tidying up beforehand. This long sleeve rib knit is another thing I got from Tobi, the cool LA based brand I mentioned in last week's post on party season fashion. The hook and eye detailing all along the sleeves is something I haven't seen before, and whilst it might be simple, it makes this cropped jumper feel so special. Essentially, I'm just wearing a black jumper, one of many in my wardrobe, but that small silver detail makes me feel like a million dollars. Granted, it's hardly seen the light of day as I'm at my desk almost 24/7 lately, but I can't wait to wear this out more and show off these sleeves. Something else guaranteed to get you out of a wardrobe rut is something bold. In this autumn outfit, we have two things: a bright red beret and some sassy striped trousers. I've mentioned before about how wearing red makes me feel confident, and it's still true. I've had one or two funny looks when wearing this beret, but it makes me smile at least. Do you have anything in your wardrobe that can spin you around like that? You look fab. as always. Your red white and black striped trousers, fancy hook-and-eye detailed long sleeved rib-knit from Tobi, red beret and Van's sneakers. 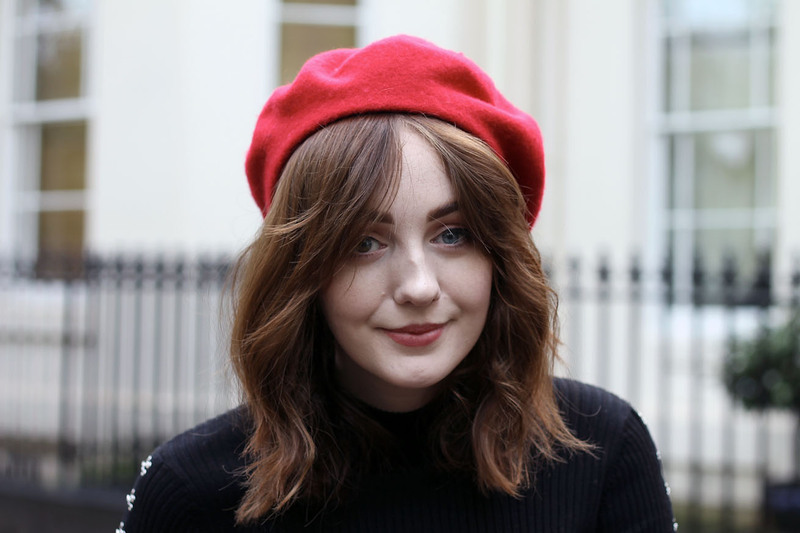 The cute bright red beret helps draw attention to your hair, which looks beautiful! I'm sorry for leaving an incomplete sentence in my comment (oops)... I neglected to proof read before I hit "publish" - I had meant to write in the comment that the outfit pieces all look fabulous styled together, and that you look fabulous wearing them! You look fab Allie. Love this post! I pull out outfits sometimes that I know will just make me feel better!